In 2015 Lincoln Park Steps was awarded the Public Program Award. This award recognizes inspirational grassroots action. The Lincoln Park Steps sit at the edge of Lincoln Park on the Western end of California Street and date back to the early 1900’s. In 2007, Friends of Lincoln Park founders, Anna Yatroussis and Meg Autry, had the vision for a complete design and structural renovation of the Lincoln Park steps, an iconic staircase that had seen decades of neglect and decay. With their vision articulated and a plan in place, they built a core team. The San Francisco Parks Alliance was brought on board as the fiscal sponsor. Jim Westover of William Duff Architects and Gerry Agosta of BV Builders joined the effort, providing pro bono services for this seven-year project. Renowned local artist Aileen Barr was hired to design and create the steps. 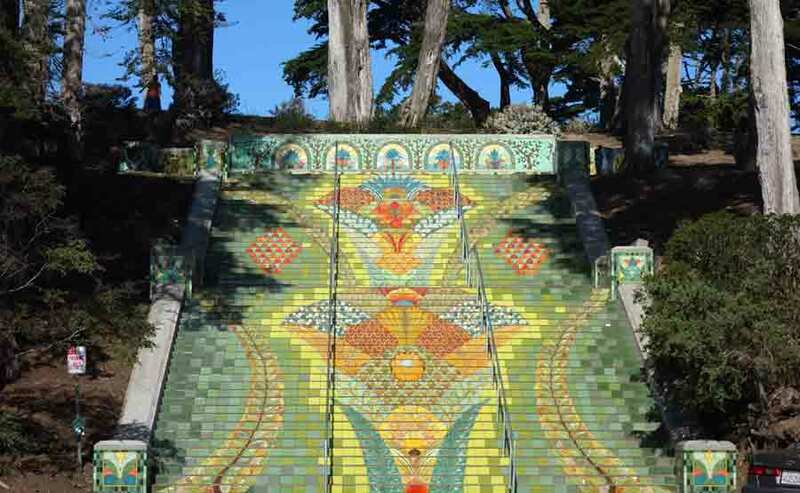 The San Francisco Recreation and Park Department awarded the project key grants that made the structural repairs and improvements possible. The result is a magnificent beaux arts-inspired public art installation that will serve San Francisco for decades to come.